Eucharistic Adoration: The first Friday of every month, beginning after the 8:00 am Mass - 3:00 pm. ﻿Coffee and donuts are served after every Sunday Mass in the Parish Hall from September through May. Please stop by for refreshments and socialize with your fellow parishioners. Donations and volunteers are always welcome. 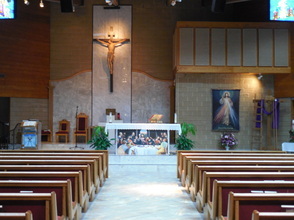 assisting with seating, collection, communion procession, and bulletin distribution. To volunteer as an usher, please contact the Church office 850 234-3266. Sacristans set up and maintain the vestments, vessels, altar cloths, and bread/wine for weekday and Sunday Masses. ​To volunteer as a Sacristan, please call the Church office 850-234-3266.